Aconitum napellus is known by many common names, perhaps the most common ones being Monk's hood, others include Common Aconite, Wolfsbane (Also see Arnica montana), Adam & Eve, Fuzi, and Helen Flower. It is a member of the Ranunculaceae (buttercup) family and is an herbaceous biennial or perennial. In addition to being a commonly grown ornamental garden flower, it is also used in Chinese traditional medicines and homeopathy; all parts of the plant are highly toxic. Unfortunately, misuse of this plant can lead to cardiac problems as it contains poisonous compounds. 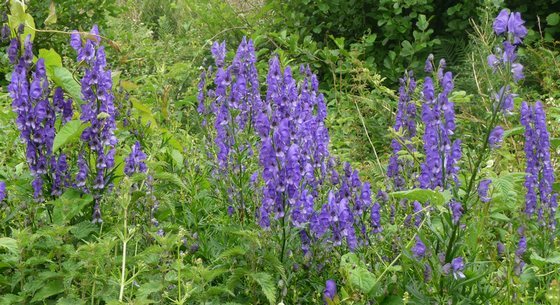 The plant was actually used to poison arrows for the hunting of wolves in ancient times, and during the Roman period it was an oft used poison, and people found growing of Aconitum napellus could be sentenced to death. In the garden Aconitum napellus is often grown in a hybrid form and is useful as part of a cottage garden, and in flower beds and borders. 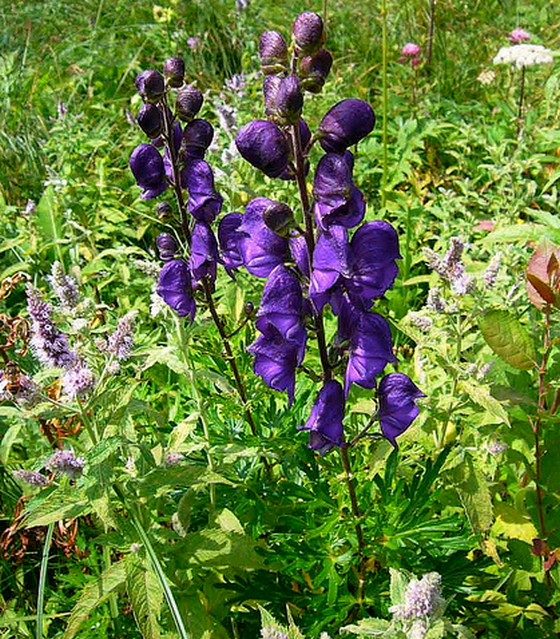 Aconitum napellus reaches up to 150 cm (60 inches) in height, and has a spread of up to 50 cm (20 inches). The leaves are dark green, palmate (5–7 lobes), and about 6 to 10 cm (2.5–4 inches) in size; they occur in spring and summer. Blooms occur in the summer and are dark blue to purple. Flowers occur on 20 cm (8 inch) racemes, are oblong, with helmet shaped sepals (which give the plant the name of monkshood), and about 1 to 2 cm (0.4–0.8 inches). In addition to the blue-purple flowers of the native Aconitum napellus, cultivars have been developed that have pink or white colored flowers. Aconitum napellus seeds are highly toxic, if growing from seed wear gloves. Sow on the surface in flats against a shaded wall. It can take from one week to nine months for germination to occur. Zones 3–8. Performs best when night-time temperatures remain below 21°C (70°F). 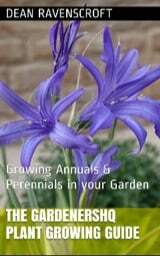 Ideally grow in a sheltered area of partial shade, but can survive in sunny areas when the soil has been enhanced with organic matter. Space at 20 to 50 cm (8–20 inches) apart. Will grow in most soils but for best results the soil should be well-drained, rich, cool, and moist. Water regularly during dry periods to maintain a moist soil, but do not swamp the plant. Aconitum napellus plants are highly toxic, be sure to use gloves when handling and avoid any contact with the skin. Do not work with the plant if you have open wounds. The roots and seeds are especially toxic. They are naturally resistant to rabbits and deer. As with other toxic plants do not grow them in the garden if you have children or pets, and due to their tuberous roots do not grow them anywhere near a vegetable garden.